Above: The palm that shaded me as I read Everything is Misc. What do these photos I took yesterday have to do with the title? This is the first time I’ve taken personal time off since I started work nearly 7 months ago. I guess I’m having too much fun running around meeting the movers and shakers in the web industry, there’s just too much good stuff and it constantly keeps me pumped. 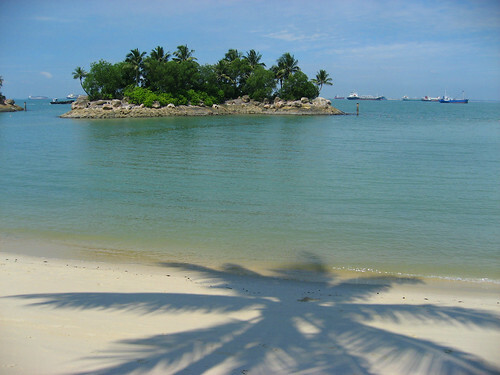 I had a chance to unwind yesterday in Singapore, and cruised over to Santosa Island, the southern most tip of the Asian continent. Maybe I’m a real web geek, but I even brought along David Weinberger, of well not him personally, but his book Everything is Miscellaneous, which I’m continuing to chug through. His book suggests that over-categorizations by centralized sources is inefficient and ineffective. By letting the crowd sort it out, and can actually be more useful. If you’re an information architect you should really be reading this book. The choices presented to consumers are nearly unlimited. For some reason I started to think about classification systems at the beach and multiple facets to place on items, even sand. One of the biggest challenges for User Experience professionals isn’t building the website, but understanding their audience. There’s a podcast interview of David Weinberger if you want to know more. It’s 2am and I was woken up by a large explosion! I though a building had crumbled down the block, as I looked out the window I realized it was a tropical storm, extremely loud thunder and bright lighting, I counted over a dozen instances as it drifted off. (you can tell if you count seconds between lighting and thunder). And if you’re not sure what Information Architecture is, and why it matters to a web strategy, check out this interview I did with Chris Baum. 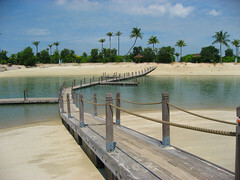 The Bridge to Paradise, here’s the specific Google satellite map, you can see the bridge.